1. Know students and how they learn. 2. Know the content and how to teach it. 3. Plan for and implement effective teaching and learning. 4. Create and maintain supportive and safe learning environments. 5. Assess, provide feedback and report on student learning. 6. Engage in professional learning. 7. Engage professionally with colleagues, parents/carers and the community. My colleague Paul Huebl, stumbled across a brilliant teachable moment whilst demonstrating how to record audio tracks and insert them onto blogs. I thought it was a great idea and attempted the same task with my students too. The task was for our students to provide words of wisdom to the Year 5’s in preparation for Year 6 in 2014. I asked my students to prepare a sentence about Year 6 and how to be successful within our year level. 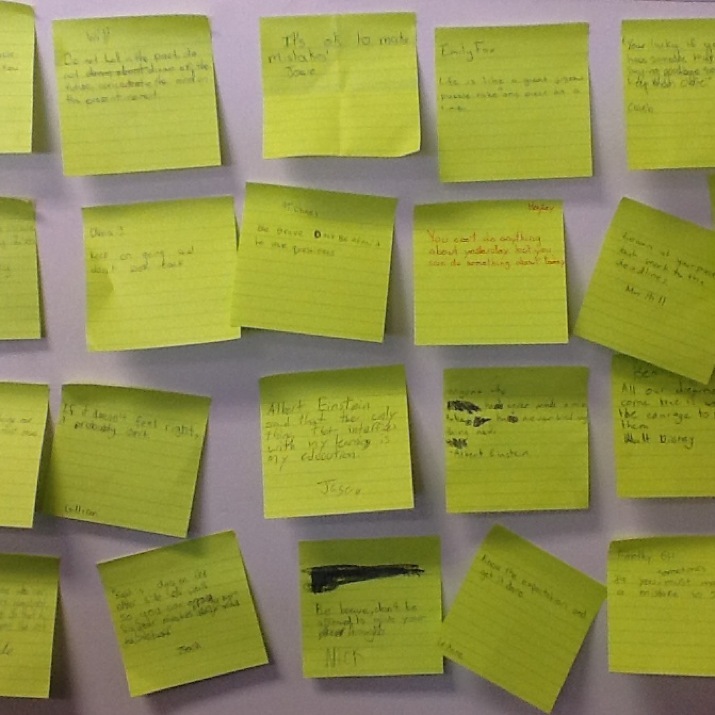 Students were encouraged to create their own phrases or find an inspiring line online. As part of teaching my students how to record and mix an audio file as a substitute for writing a blog post, I created this. Making it up as I was going along, I thought it would be a good idea to have each of my students come up with ‘words of wisdom’ that they want to share with next year’s Year 6′s. I thought it would be interesting for my current students to reflect on something that they see as important for ‘surviving’ Mr Huebl as a teacher. All the kids participated with good humour and this is our result. Day 2 of the CEGSA Conference. I found Alec’s presentation refreshing and motivational. I am eager to attend his Spotlight session: Teaching and Learning in a Connected World (15th August 2013) & Masterclass: Developing Key Literacies in a Connected World (17th August 2013). Why aren’t we engaging/allowing student to utilise phones within the classroom? Don’t limit students by telling them which tech to use. 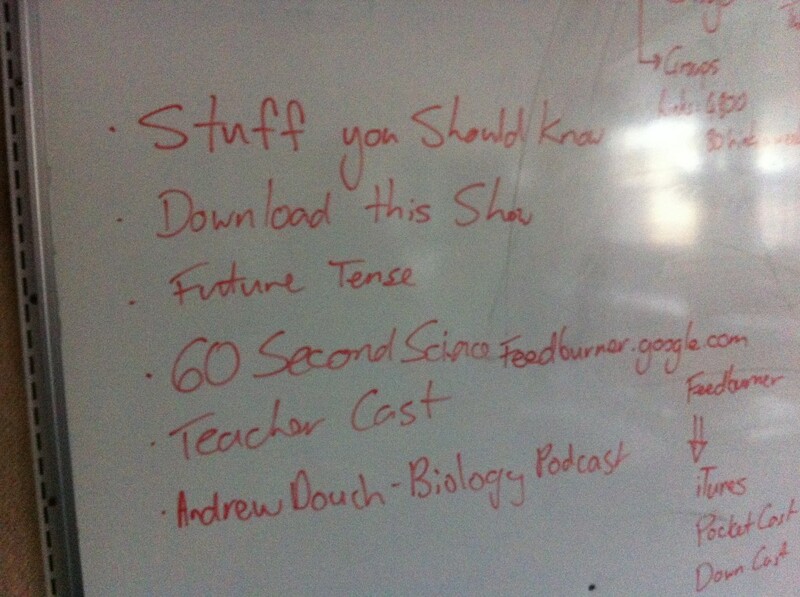 BYOManageDevice: This gives teachers starting points to know what resources will be used. Google Hangouts: look into this. Limited to 9 people chat, if you register as a school you can have 15 students. 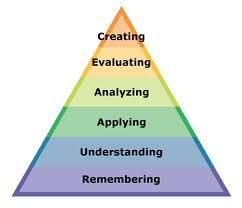 We discussed Blooms revised taxonomy: Creating being the focus and where we want our students to aim for on the pyramid. Let students have choices in how they present and direct their inquiry. I feel that I do this already within the classroom. I would like to work on being even more flexible and allow extra time for passion-based projects such as Genius Hour. If your students are engaged they will not misuse technology. If you can Google the answer you are asking the wrong question? Supply the equipment. Have the right equipment to suit the learner. Support the usage of that technology. Thoughts: Where does this fear of tech come from? If you break it, you can get it fixed, if you don’t know how to use it you can ask for help or find the answers yourself, play with it, learn from it, be a lifelong learner. Find technology mentors to help you climb the education matrix. This is where Digital Leaders can play a role within the school context. I also agreed with the notion that we should be learning from and with our students. We (teachers) are learners, this should be modelled to our students. Some people like to blog, these people are writers. Some people like to talk, these people are podcasters. Podcasts should be between 5-15 minutes long for beginners, but some podcasts can go for hours. If you are someone who has difficulty speaking publicly, have a script ready before you podcast. Do podcasts with a partner, keeps you motivated and lightens the workload. To maintain a podcast keep it up to date and spend 2-3 hours working on it per week. Research time is not included in this process (keep that in mind). You don’t need the most high tech tools, get a good mic for sound quality. Why do we need to integrate? There are so many opportunities for us to be connected educators who can connect our students with the world. Technologies allow students, teachers, parents, the community (everyone) to connect. Learning is a social function, you learn from being social. 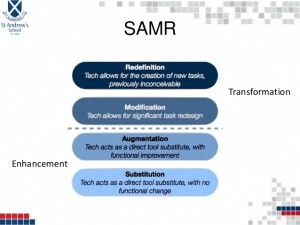 How are we going to deliver the digital technologies curriculum? Teacher training will be required to support this process. AITSL: Standards (2.6, 3.4 & 4.5) require that we teach using digital technologies as part of our teacher registration standards. This is motivation enough to get on board if you aren’t already. If you are engaging with substation tasks too often think about level of engagement and how this benefits the learner. 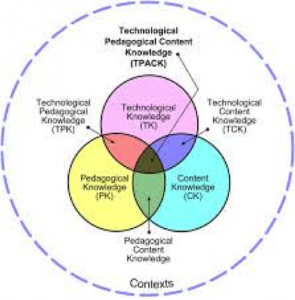 Rich engaging learning using the TPACK model. 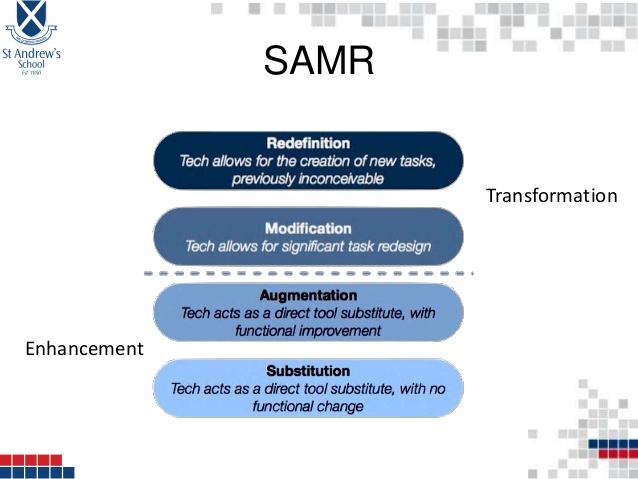 How are you going to use tech in your teaching? If you plan it well it will work well. Experimentation: giving things a go. Shadow theatre, School’s got Talent. Passion based learning. http://goo.gl/kkGMA Slide share of Paul’s presentation. I work with Paul and found his presentation engaging and informative. I particularly enjoyed learning about the TPACK and SMAR models to effectively integrate technology into learning. I think I am good at doing this but require more focus to recognise opportunities for integration. Developing my knowledge base on the different types of tech available and being creative with my implementation will assist me here. What a day! I thoroughly enjoyed the CEGSA/ EdTechSA Conference. I am looking forward to future EdTechSA events and plan on attending committee meetings to see if I can volunteer or be of assistance at the next conference. I would love to discover an area where I may present at a conference in the future too. I am currently attending the CEGSA/ EdTechSA 2013 conference. Today I have listened to 2 keynote speakers Mark Sparvell and Nick Jackson. 1. Technology is the key to taking action within our world today. Technology encourages creativity, socialisation and an active path to engage with society. 2. Technology was not invented to make the teachers job harder (although we may feel like it does sometimes! ), we want our students to work harder, not the teacher. Technology is a tool to aid us in meeting learners needs in a complex world where we don’t know what our students need for their future. 3. Do not covet your ideas, give away everything you know and more will come back to you. This idea of collaboration and sharing our knowledge and learning with the world. Making learning relevant and useful. Sharing what we know and seeking answers to things we don’t. 4. There is real learning to be had in conflict. Testing our ideas, sharing and proving our theories, learning from others opinions etc. We need to engage with others to get a global view not simply a single class perspective. 5. The 3 P’s: Play, Project Management and Problem Finding. Engaged and successful students will play to create, explore and understand. Students will manage their own projects (Passion based learning) and direct their learning. Problem Finding: inquiry leads to deeper understanding on a personal level. We want our students to find answers to their own questions in any means suitable to them, using tech has made this easier. The second Keynote speaker was Nick Jackson whose message about Digital Leaders had me thinking about how to implement this within my own school. 1. Empowerment: the giving or delegation of power or authority, authorisation. Communication is the fundamental concept here surrounded by trust, respect, territory and control. We want to empower our students, give them responsibility and power, take control of their territory (learning environments) and learning and to trust us (their teachers and peers) in this process of learning and life. 2. “Learning is most effective when it is active, involves working on real tasks in collaboration with others- in both virtual and physical settings” (Education Services Australia, 2009 a, p.2). We need to make learning authentic and purposeful. Being connected to our world, global perspectives, the ability to investigate and find answers to real life problems. 3. Digital Leaders: Nick had a team of students who were digital leaders within his school. In Year 6 we have been exploring this in peer modelling/ teaching. We would like to take this one step further and implement Digital Leaders across Year 5 & 6 within our school. Digital leaders, (Tech helpers) assist teachers and peers with their technology learning, via trouble shooting or modelling how to use/ solve issues. I think that this could be done through ICT Club within our school or just within Year 5/6 & 7 classes. The Year 7’s already have a Leadership Program, I think this would fit in nicely within our school context. After Nick’s keynote presentation I spoke to him about coming to our school and speaking with staff about his findings and work in this area. I think we need to push for teacher & parent involvement/ understanding. Students know how, we need to catch up with them! Planners or diaries time management. Synchronize home and school calendars. Day Map (Unley high school timetable) We would use KnowledgeNet here. Backup to a computer not just iCloud. iPads are delicate tools. If they get broken suggestion to fix them: Storage minders, Digimob in the City, AllTec fixing iPads. Have protective cases. Armor cases, look into it. Reminders to charge at home before school, no charge, use old school paper and pencil. Homework Apps: Keynote, Pages and Numbers. Sharing assignments, drop box, email, Knowledge Net or any learning platform. Airplay, Apple TV useful to connect iPad to the screen as opposed to Interactive whiteboard across Year 6. Suggest to committee. Our team will need to find all of the standard apps we want our students to use, these will be purchased first above games and personal apps. Garageband Smart Instruments, I can play an instrument that I do not know how to use. Tuner and time keeper both apps free for tuning instruments and keeping time. Stylus, pad on the end, no lagging and more precise. Jot Classic Stylus, LeetGeek Stall. Brushes: drawing app, playback shows the process of making and creating of images. Simplified Photoshop but you cannot put words into Brushes. Procreate: user friendly again easier to use than Photoshop. Note: Give students choice with tools on iPad apps, obviously needs to be compatible to hand up etc. LanguagePerfect Eg Chinese, Italian. Allows you to practice tones, pronunciation, writing etc. Searches through dictionary much easier, you can draw symbols, do direct searches and get interpretations. The app is free but the school needs to subscribe. 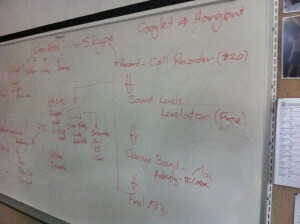 iTunes U: Useful for everything! Easy Chinese, online courses, quizzes, lectures, textbooks etc. 4 Students from Unley high school spent the sessions explaining how they use iPads across the curriculum in high school. Suggested apps they use across subjects. Some didn’t match obviously as we are Primary school but some were good suggestions. In relation to specialist staff I would recommend that Music and Art teachers utilise iPads within their programs. Chinese could benefit too. I think staff should find the apps that we want to use and create a list for our student as part of their booklist, apps should be installed before school begins. We should utilise Google Docs, Calendars, email etc. Also look into iPad guided app, which locks apps for use during lessons and explore Touch Autism: Social Stories about how to manage my own device. 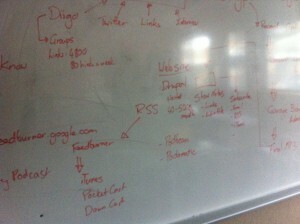 This afternoon Paul went through the usefulness of blogging with your students and its educational benefits. Blogging essentially is a learning journal for your students/ class. It improves literacy, writing skills in particular. It documents learning experiences via text, images and videos. It allows students to publish their work to a wider audience. 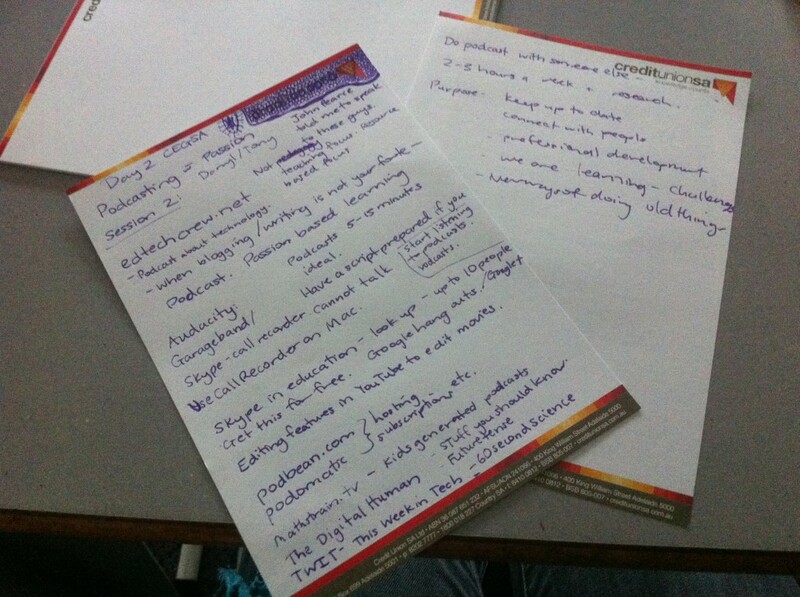 I used part of this session to blog about my personal learning today, and now you have read it! Looking forward to the Teach Meet session later in the afternoon and Day 2 of the CEGSA conference. I will blog again tomorrow. Please leave me some feedback, as I am quite new to blogging about my professional learning. Being a Teacher and a Mum: How do we return to work? No Computers to Be Found! No Screens at All! They’re Not Allowed in the Classroom!!! As an educator I feel it is one of my responsibilities to reflect on my professional practice. This in turn will assist me in developing my teaching knowledge, skills and standards. My professional blog will record my progress and provide evidence of my development. I will be using the AITSL teaching standards to address and meet teacher registration guidelines. mrhuebl on No Computers to Be Found! No Screens at All! They’re Not Allowed in the Classroom!!! Jade Vidovich on Week 6 Staff Meeting: Using data in a holistic way to track and analyse progress.